Anyone in academia realises that there just aren’t enough hours in the day. When I first started teaching I had plans of learning more about teaching, I envisioned myself understanding pedagogies and theories and thought I’d regularly read education journals. I was soon to realise that while it was a nice idea it was not going to happen. However, I was still determined to learn more about teaching. The biggest resource I was to learn was not the myriad of academic journals but my colleagues both within and external to my department. Communication with others in the university has been the biggest factor in keeping my teaching fresh. Through participating in TDU seminars and the teaching network meetings I’ve been able to talk to teachers outside of my faculty. This has been invaluable. It opened my eyes to the fact that we become very entrenched in the way we do things. It’s always been that way so it must be right. Going through university right from the undergraduate level we become accustomed to a certain style of teaching and assessing, as students we accept that this is the norm. When all the papers are presented in a certain way it seems that must be the right way. And thus when moving roles from student to teacher it is unsurprising that we emulate the styles with which we were taught. As a new teacher, I knew no different, I had not been exposed to many different ideas. Being able to converse with teachers from different disciplines opened a new world. At the TDU seminars I would hear what seemed like impossible ideas. What do you mean we should give them a marking schedule? Shouldn’t they have to work out the question, interpreting what I’m asking is all part of the mystery. The more I talked with others the more I realised that teaching has to evolve and sharing ideas is such a valuable tool. Even within a discipline, the act of just talking with colleagues about what they are doing in the classroom can open you to new ideas. A simple conversation in the tea room, or attending the school teaching advocacy sessions allows for this exchange of ideas. We tend to think of teaching as something we do in isolation (even with 200 students watching us) but we need the feedback and advice of those around us if we hope to keep our teaching alive and avoid the tedium that can come with repetitive teaching. I am lucky that I teach in a role that allows me time to regularly talk to my students and from them I can gain feedback. In every class students are given an opportunity to write down comments through the use of a “feedback box”, in addition to being encouraged to post on moodle. One of the natural ways I keep my teaching fresh is purely through identifying a need. In the first year of teaching it seems to be more about getting through (and hoping you don’t make a fool of yourself). Once you’ve made it through that year it is like you’ve passed this first test and you start to settle in to teaching. This is when I was able to change my focus and started identifying problem areas both in my teaching, and the courses I taught in general. Any good teacher is going to address these problems. Sometimes the problems are easy to fix, other times they take some creative thinking. A few years ago I realised that one area of my teaching just was not working, the students were disengaged and found the topic a bore. So like most of us I started thinking how I could alter this, and as I started planning I starting to keep a journal with ideas. At first it was very factual and rudimentary, focusing on experimental change. To my surprise the nature of the journal changed, as I implemented my new teaching strategies I started recording students reactions. The changes brought about conversations with students that were unexpected, they moved beyond what I was teaching and asked questions. Writing down these conversations I began to see the value in keeping a journal. I was later to learn that this was called being a reflective practitioner. This one small change helps keep my teaching fresh because it is a constant reminder of what I’m doing, what is working, what I did in the past and how the students are reacting. With time and confidence you start casting your net wider. I’ve joined online communities, forums and blogs all allowing us to share our problems, successes and ideas. I’ve become more familiar with some of the education terminology and while I’m not quite at the stage of regularly reading journals, articles from education periodicals are becoming more frequent in my reading list. In some ways this is quite a way off from what I usually write for this particular blog (it’s from my Bioblog). I’ve republished it here because it’s something that I do want to get out to science educators – especially biology educators – as widely as I can. Please find a link to the critically acclaimed resource (http://programmingoflife.com/watch-the-video) dealing with the nature of science across disciplines/strands. Interesting to see an attempt to link it into the current NZ Science curriculum with its focus on teaching the nature of science. Freely share this resource with the teaching staff in your faculty/department. So, I have been to the website. I intend to watch the video tonight (from a comfy chair), but the website itself raises enough concerns, so I’ll look at some of them briefly here. And I’ll also comment – if they really are ‘doing science’, then it’s not going to be enough to simply produce a list of ‘examples’ of the supposed work of a design entity (because that’s what all the computing imagery is intended to convey) & say, see, evolution’s wrong. That would be an example of a false dichotomy, & not scientific at all. They also need to provide an explanation of how their version of reality might come to be. Programming of Life is a 45-minute documentary created to engage our scientific community in order to encourage forward thinking. It looks into scientific theories “scientifically”. It examines the heavy weight [sic] theory of origins, the chemical and biological theory of evolution, and asks the extremely difficult questions in order to reveal undirected natural process for what it is – a hindrance to true science. This video and the book it was inspired by (Programming of Life) is about science and it is our hope that it will be evaluated based on scientific principals [sic] and not philosophical beliefs. Unfortunate, then, that they wear their own philosophical beliefs so clearly: ‘undirected natural process’ as a ‘hindrance to true science’. The bacterial flagellum is a motor-propeller organelle, “a microscopic rotary engine that contains parts known from human technology such as a rotor, a stator, a propellor, a u-joint and an engine yet it functions at a level of complexity that dwarfs any motor that we could produce today. Some scientists view the bacterial flagellum as one of the best known examples of an irreducibly complex system. This is a single system composed of several well-matched, interacting parts manufactured from over 40 proteins that contribute to basic function, where the removal of any one of those parts causes the entire system to fail. ** As noted on my link for this example, there is no such thing as “the” bacterial flagellum as the sole means of bacterial locomotion: different prokaryotes get around in different ways. Nor is the flagellum a case of design; its evolutionary history has been quite well explained. The lack of quote closure (& of citation) is in the original. Mitochondria have their own executable DNA programs built in to accomplish their tasks. Well, yes, & no. Several key mitochondrial genes are actually found in the cell’s nucleus – something that allows the cell to control some aspects of mitochondrial functioning (& incidentally prevents the mitochondria from leaving!). There’s a good review article here. That the number of nuclear-based mitochondrial genes differs between taxa is a good argument for evolution; for design – not so much. Much like the firewall software on your computer the membrane contains protein gate keepers allowing only those components into the cell that belong and rejects all other components. The membrane is thinner than a spider’s web and must function precisely or the cell will die. Well, d’oh – except when it doesn’t. Viruses, and poisons that interrupt cellular metabolism, get in just fine. They really are pushing the boundary with this computer metaphor. The human eye is presented as an amazingly complex ‘machine’ – yet we have a good explanation for how that complexity evolved. 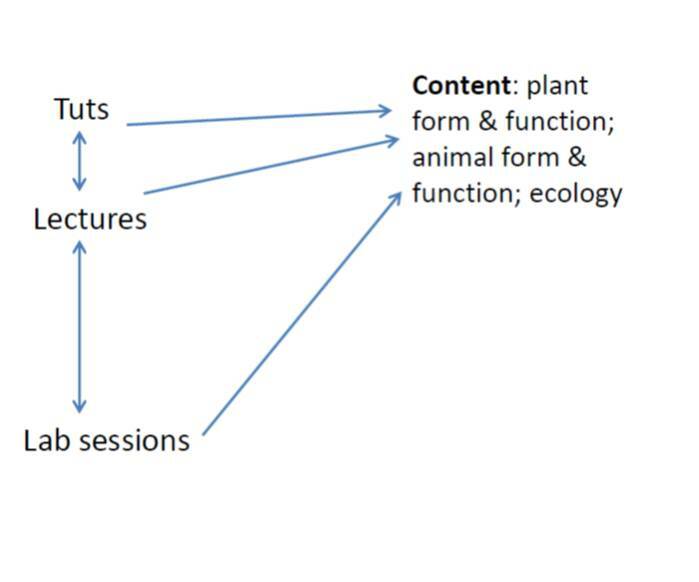 And more telling (but omitted from this presentation): the eye’s structure isn’t perfect – it’s a good demonstration of how evolution works with what’s available,but hardly an argument for the wonders of directed design. The same can be said for the human skeleton, which is also in the taster selection, along with the nucleus, DNA, & ribosomes (which come with more, lots more, of the computer software imagery). As I said earlier, if this video is not simply another example of the use of false dichotomy to ‘disprove’ a point of view with which its authors disagree, it had better provide more than metaphor. That is, I’ll be looking for a strong, evidence-based, cohesive, mechanism by which these various complex features sprang into being. Otherwise, we’re not really talking ‘nature of science’ at all. Human DNA is like a computer program, but far, far more advanced than any software we’ve ever created. I had a couple of thoughts; a) metaphor is a wonderful thing, & b) Dawkins is a biologist & science communicator, but not necessarily big on programming. (If I am inadvertently doing him a disservice, I apologise!). Someone else had the same thoughts. And someone will always ask, do university lecturers have any training in how to teach? After all, these days primary, secondary & pre-school teachers are all required to have professional qualifications in education. Back in the ‘old days’ (ie when I was a student, lol) you probably would have been scratching to find any university lecturer who had a teaching qualification alongside their discipline-based qualification. (Back then, Colleges of Education were generally not part of the university system here in NZ.) These days, universities have some form of professional qualification available for their staff to study for, but it’s purely a voluntary decision to take it up. It’s probably fair to say that a significant majority of university lecturers still do not have formal training in education. The obvious question is, does it matter? After all, generations of lecturers have learned the necessary skills ‘on the job’, and generations of students have completed their degrees or diplomas & gone on to graduate. ‘Accreditation’, as used in this report, refers to an endorsement by an independent external agency that a professional preparation course is adequate for the purpose of a particular profession; that the course is able to produce graduates who meet standards for entry to the profession and are competent to begin practice. ..Accreditation is also an important mechanism for engaging members of a profession in decisions about standards expected of those entering their profession, as well as standards expected of preparation courses. some common understanding of core learning and teaching principles. This sort of professional development, leading to accreditation, should probably be focused on new lecturers to begin with, as they’re arguably those who really, really need such support. After all, as Kevin pointed out in his talk, if you’re thrown in the deep end & simply emulate the practices of those who taught you, you’re likely to pick up some pretty bad habits along with the good, & over time these can become deeply entrenched. (Which does suggest that it would be good, at some point, to involve experience lecturers in the conversation around best-practice in teaching and learning as well.) And you could also ask, why should both new teachers and their students struggle while the teachers find their feet? That’s not good for anyone. an expectation that universities should be more accountable to funding bodies and other stakeholders (students, parents, employers, etc.) (Hicks et al, 2010). One way to respond to this is for institutions to be able to demonstrate that their staff have that “common understanding of core learning and teaching principles” and are able to apply these in their classrooms for the good of their students’ learning. And what’s the best way to show this? Through some form of accreditation. How do you give feedback to university teachers? – this was the search ‘topic’ used by one visitor to Talking Teaching. It struck a chord with me as I’m part of a small group of people discussing that very question, so I thought it might be a good topic for a blog. Not least because actually sitting down & writing about it should help to focus my own thoughts on the issue. My institution expects teaching staff to carry out regular appraisals of their papers & their teaching in those papers.While there are a number of ways to do this, in practice most people use the ‘standard’ form: a set of Likert-scale questions on both paper & teachers that are common to all appraisals; a set of open-response questions (identify 3 things about this paper/teacher that should be changed/kept the same); &, if the lecturer chooses, some other questions as well. (Last year I included a set about student’s perceptions of Panopto, for a research project that I’m running with a couple of colleagues.) So there’s potentially quite a bit of information available there. It’s what happens to this information, of course, that matters. Here, the current state of play sees lecturers receive a summary of the Likert question responses, plus any demographic information, fairly soon after the semester ends. Once the grades for the semester are finalised, we’re then sent the original survey forms, so we can then read the open-ended material as well. Both lots of information are potentially extremely useful if you’re wanting to improve paper delivery & your own teaching. The thing is – does everyone actually read it? Anecdotal evidence would suggest not: that the sheaf of paper may sometimes simply be flicked through (at best) before relegation to the paper-recycling device commonly known as a rubbish tin. When this happens, both students & teacher miss out. The students have spent time engaging with the questionnaire & do have a right to expect that their words will be read & (hopefully) responded to. And the lecturer may have missed out on suggestions that might allow them to enhance their paper’s delivery. And of course, there’s no closing of the feedback loop – letting the class know that you’ve read their comments & suggestions, & explaining how & why (or why not) you’re intending to respond to them. This in turn can see students becoming quite disillusioned with the whole process. One of the options we’ve discussed, as a means of improving this part of the system, is whether to provide teaching staff with a summary of the open-ended questions as well, perhaps with a commentary alongside: “X% of the class felt that…. This suggests that… – have you considered the following.. ?” This, of course, would constitute a lot of extra work for our Teaching Development staff! And there’s also the question of whether this is the best, or the only, way of getting feedback on one’s teaching.What about on-going formative feedback during the semester, using techniques like one-minute papers or ‘muddy questions’ (in which students highlight the points in a lecture that most puzzled or confused them)? Or the use of feedback surveys in learning management tools like Moodle? There’s also the issue of perceived legitimacy – I’ve heard it said that students don’t know enough about a given subject to give any meaningful comment. (While this is likely true about the content it’s certainly not the case for the methods – students do have a fairly good idea of the teaching styles & tools that work best to enhance their learning.) Would feedback be better coming from peers rather than students? How comfortable would lecturers be with having a colleague sitting in on their classes & providing constructive comments afterwards? Students in my first-year bio class have quite varied backgrounds in terms of their prior learning in biology. 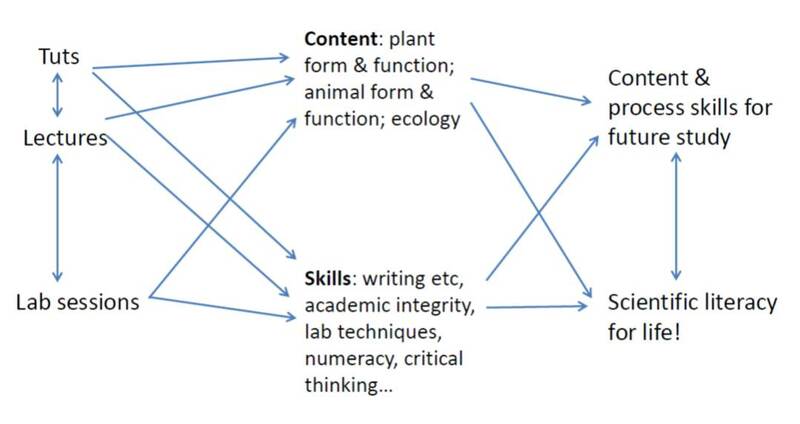 I’ve had a little survey running on our Moodle page in the lead-up to beginning to discuss plants: roughly 1/4 of them didn’t take year 12 (6th form) bio; 1/4 did, but didn’t study plants; and most of the rest both studied year 12 biology and learned about plants. (For readers outside of NZ, year 13 is the final year of high school.) 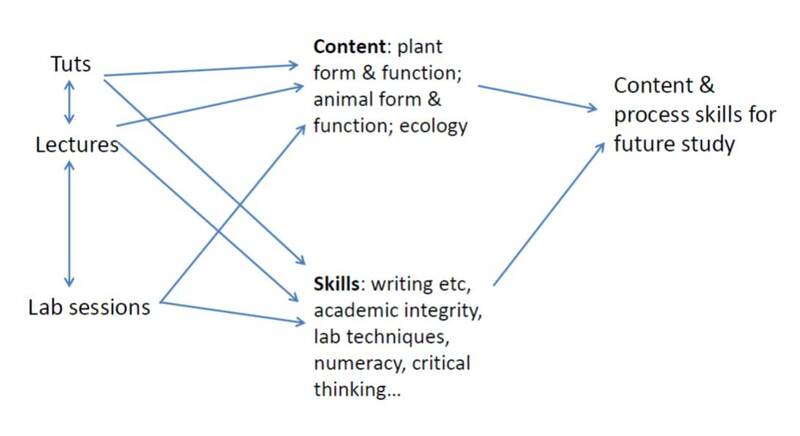 This is going to make teaching about plants – which occupies not quite half of the paper, quite ‘interesting’. It also means, of course, that 25% of the class don’t have any formal leaning in biology as a separate subject at all: something that my colleagues & I need to keep in the back of our minds in our teaching. And of course, even those who report having studied something in school may not actually remember it in any meaningful way, in the sense of having accurate conceptions about the topic. However, the misconceptions that they may have in lieu can make expanding & correcting their understanding quite tricky. For this reason, a few years ago I began starting the new semester with a class called ‘Basic Biology Bits’ – pop quizzes & discussion around a few key ideas that many students appeared to be having trouble with. Feedback from the class was positive, so I’ve kept that in the curriculum. However, having read & blogged about visual curricula, I realised that just dishing out a set of apparently unrelated concepts probably didn’t make a lot of sense to the students, even if they were gaining an enhanced understanding of the concepts in isolation. So now I have a little map to show them where we’re heading, & I thought I’d share that here (since my last post seems to have attracted so much interest, lol). This gave the opportunity to talk about just how ‘small’ is small & to introduce the units of measurement (micrometres) that they’ll be using with their microscope work in the lab. I find a lot of bio students tend to be quite maths-phobic & a little gentle intro to these units & also to the idea of converting between them will hopefully be useful when they come to work out the size of the things they’re seeing down the microscope. And the ‘why’ question meant that we could talk about diffusion & osmosis & why multicellular organisms need some sort of transport system. 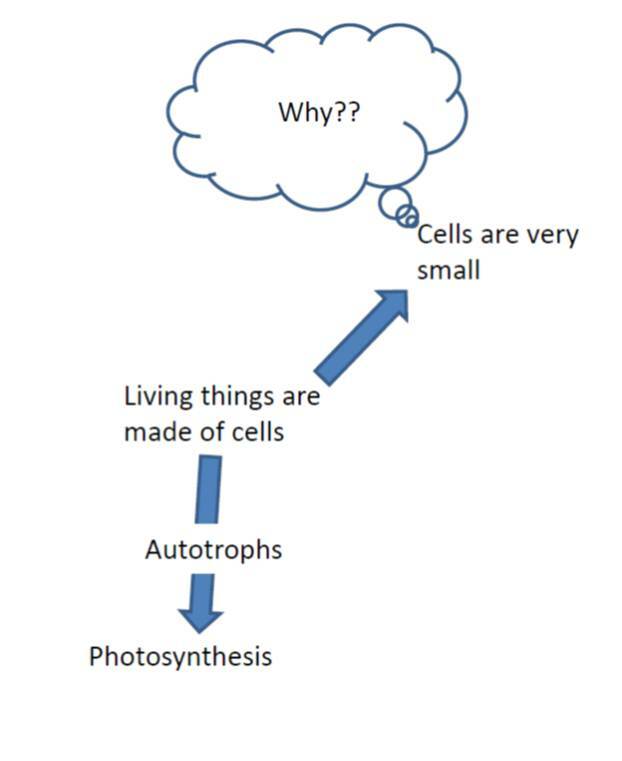 A few years back I was rather taken aback to discover a particularly common misconception among our first-year bio students: the idea that plants photosynthesise, but don’t respire. Ever since I’ve taken the time to point out that all living cells respire, albeit not necessarily aerobically. 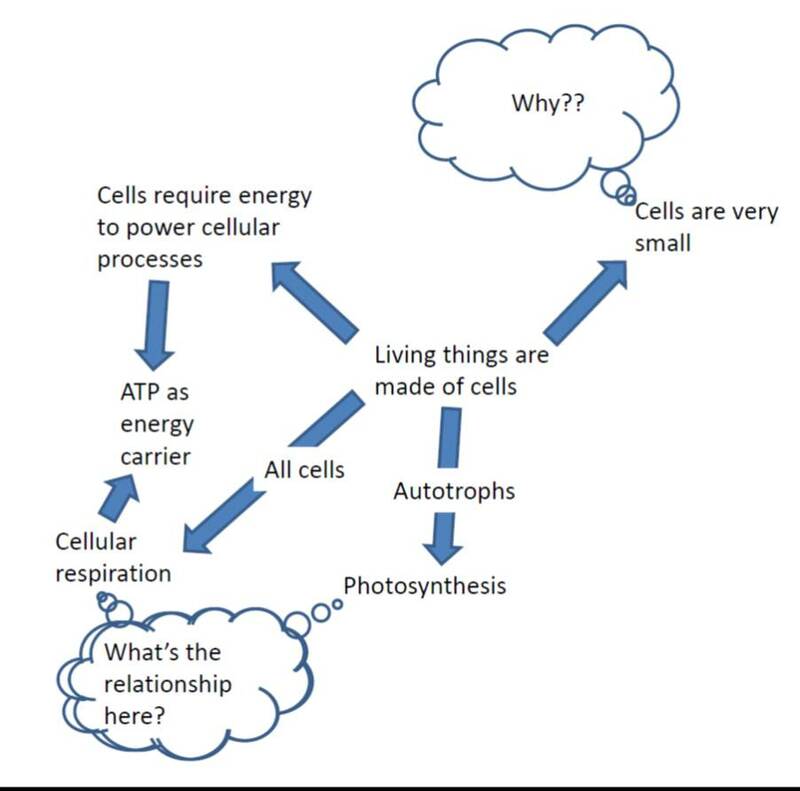 I use a couple of pop quizzes on the processes that cells might need energy to carry out. 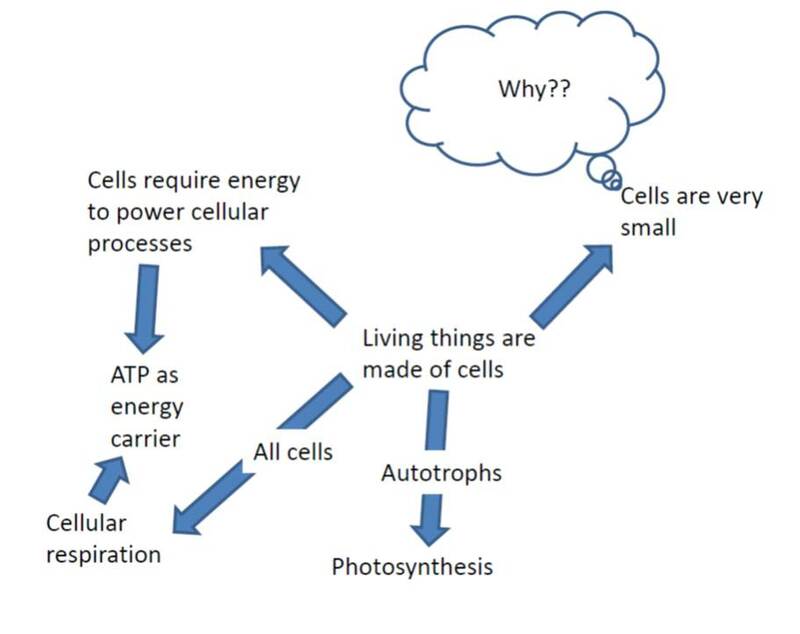 And we also talk about ATP as a carrier of energy – and why cells might need such carriers. (Don’t know how I managed to include that line just above!) It’s interesting to think about respiration & photosynthesis in terms of the carbon cycle, something that we’ll be considering in more depth towards the end of the semester. And finally, reminding them of the role of DNA in controlling all these goings-on. (That 25% of the class who didn’t study biology at the senior high-school level are going to need a lot of help in this area!) 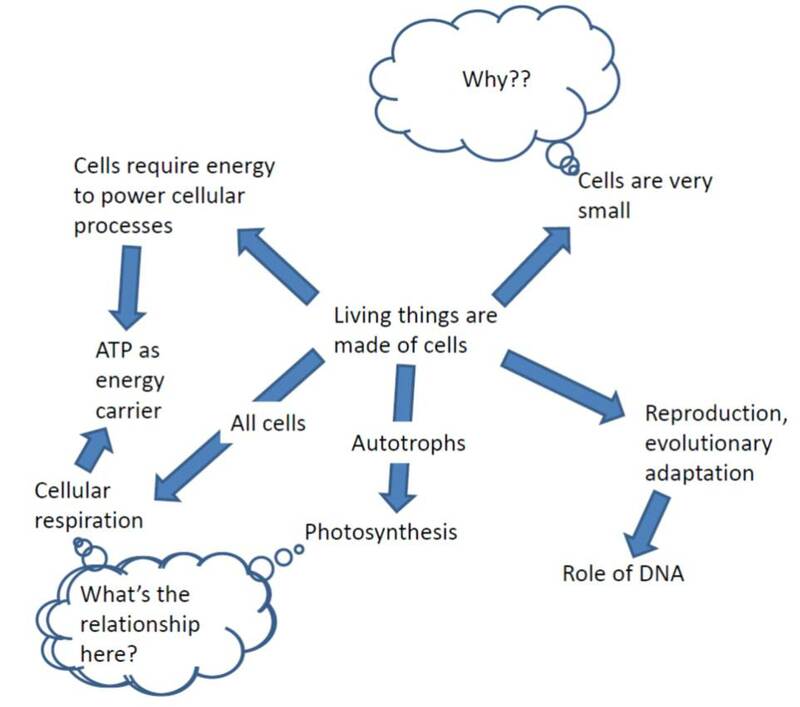 When we looked briefly at mitochondria & chloroplasts I noted that both organelles have their own loops of DNA – & asked why some mitochondrial genes are located in the nucleus & not in the mitochondria at all. A very interesting discussion ensued. So now we could look at those other skills & why they are relevant. We’d talked a bit about plagiarism at orientation last week, so I could check back on their understandings around this – & emphasise that we’ll be working with them to develop their skills in academic writing, referencing, citations & so on. And critical thinking – to me, this is surely one of the most important skills that any student could acquire during their time at university. Now, where are we going with all this? Well, there’s the obvious one – that first-year is expected to turn out students with the knowledge & skills that they’ll require if they’re going on to further study in the subject. But there’s a second, equally important point here, and it hinges on the fact that there are quite a few students in the class who aren’t going to major in biology, & who may not actually be science students at all – they’re taking the paper as an elective in another degree altogether. What do I hope they will gain from it? Yes – apart from (I hope!) helping them gain an enthusiasm for & appreciation of the living world, I really really want to enhance the scientific literacy of all my students, so that they can apply this understanding in their own future lives, regardless of whether they’re going on to a career in the sciences. [many] students may appear to be unqualified, unprepared and uninterested. But if you believe, as I do, that each one of them has a talent, each one of them has a capacity to develop – intellectually and emotionally – then it follows that each one should be given a fair chance to succeed. 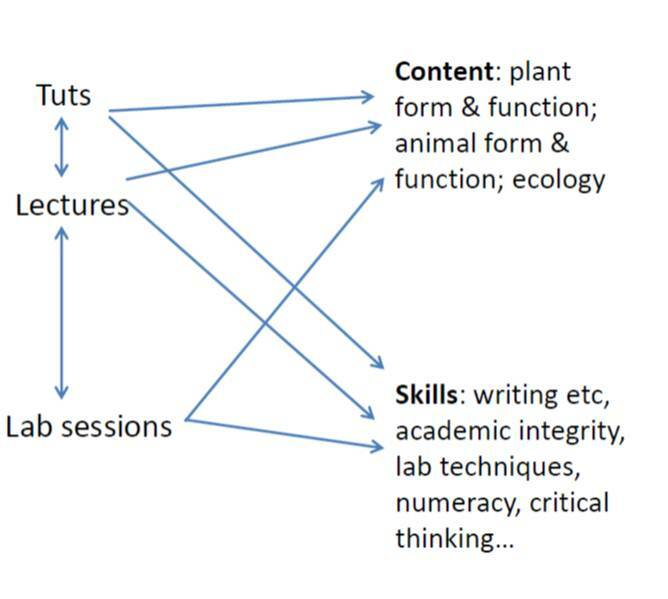 [there] is an alarming scarcity of interdisciplinary courses, little integration of existing courses, and almost no alignment to achieve the specific outcomes that these collections of courses are geared towards. This is especially true of first-year courses with large impersonal classes taught by teaching assistants and part-time instructors. 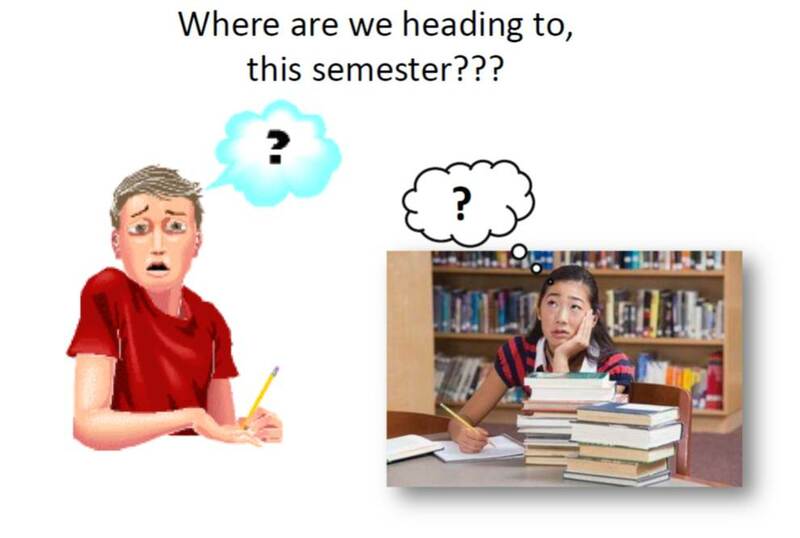 It is exactly during this time, the first-year experience, when students are making important transitions, when students require a lot of personal attention and when they seek faculty (ie staff] time. It is a time when we should put our best teachers on the front lines and offer an experience that few, if any, students will be able to refuse. I couldn’t agree more, & it’s the reason we (my wonderful colleague Brydget, & I) keep reviewing the labs we offer to our first-year bio students. Lab classes being so much smaller than lecture streams, they represent an excellent opportunity to give students one-to-one attention. This year we’re trialling a peer mentoring system: another chance for students to form good working relationships with others in their class & work together to enhance their learning. Arshad’s article is a strong argument in support of the need for regular & thorough review of teaching programs – not just individual papers, but the actual degree programs themselves. Otherwise there is always the risk that the collection of papers, overall, can lack focus – and that is not going to produce the best learning outcomes for our students.